How to stay fit on the road. I talk about taking your fitness on the road to visit CrossFit affiliates at home and abroad, and I speak with nomad CrossFitter Chris Kerr who has taken this very idea to heart because he has to. Chris travels substantially for work and so he works out at whatever affiliate happens to be nearby when he lands somewhere and discusses the rewards and unique challenges of taking his CrossFit experience with him on his travels. Welcome to the BoxJumper Podcast Episode number seven! I’m your host Jean St-Amand, a CrossFit L1 Trainer and Catalyst Athletics L1 Certified Weightlifting coach, masters athlete, husband, dad and small business owner in Bedford, Nova Scotia, Canada. This podcast is a deep dive into everything CrossFit and fitness – basically just me exploring elements of this fitness journey that I’m on that I find interesting and that I find might be interesting to others. When I first started this crazy BoxJumper idea my intention was to make it all about visiting as many boxes as I could. Noble and ambitious idea though that might have been, it was perhaps a little less practical than I had thought. I do travel occasionally, personally and for work, but it’s often to the same areas, so the range of affiliates that I’d be able to visit over time was relatively limited. So that prompted me to shift gears and turn BoxJumper into a website and a podcast. While I still visit affiliates when I travel, it’s not the focus of what I do with the website and the podcast on an ongoing basis. That being said, I did just come back from a family vacation and, of course, I dropped into a couple of boxes while I was away. As always, the experience was awesome. The communities were welcoming, the coaching was excellent, the programming was varied – exactly what you hope for when you walk into a box for the first time. For those of you out there that haven’t yet had an opportunity to drop into another affiliate, I would encourage you to give it a try. Even if you just visit another box in your area, it’s a worthwhile experience for several reasons, and I’ll give you sort of my top three. You know what the CrossFit community is like, and I would expect dropping into just about any box the community would be happy to see you and give you a warm welcome and a great workout. Make sure to stick around afterwards and take some photos! The whole idea of CrossFit is functional fitness that can be applied anywhere, and so preparing you for the unknown. To walk into another affiliate and be challenged by someone else’s programming is useful. Anything that you can get out of that can get you out of a routine (if a routine was to be had in CrossFit generally anyway) is a solid way to prove the work that you’ve put in to this point has been effective. In your own gym, invariably you’ll get comfortable. And it’s a good thing, don’t get me wrong. You get comfortable with the coaching style and the cues that you hear from the team in your box. You may only see a couple of coaches per week because they’re coaching the same classes on the same schedule that you use for your workouts. But there may be other coaches in your box that you don’t get to work with. Adapting to the coaching at any given time is a useful skill, and you may get a cue that you haven’t heard before that helps you move better. You may absorb the very same cue that you’ve heard dozens of times because it was delivered differently by someone else. And there’s lots of benefits to being exposed to new coaches. That’s easy when you go to another box. So as long as you check the ego at the door and you listen to what other experienced coaches have to say, you’ll be in great shape. Now, there’s a variety of other reasons that it’s worthwhile to visit another box, but rather than give you a bunch of my reasons, as it happens I have a guest this week that has very much taken this idea to heart. I was connected with Chris Kerr just as I was returning from my family vacation. He messaged Osprey Athletics on Instagram asking about a drop-in class and one of the other folks that, along with me, monitors and manages the social media channels for Osprey, quickly responded with some of the particulars. Chris message back saying that he would be by for an evening class that night and it happened to be the same day that I was getting home from my road trip. He also said that he regularly drops into other boxes and had plenty of experience in CrossFit. He shared that he was aiming to visit a hundred boxes before the end of the year, and Osprey would be number 69. Upon hearing that, PJ Mäkinen, who also co-hosts another excellent podcast called Night and Day, with his wife Alanna all about CrossFit, family and healthy living, told Chris about my similar box jumping mission and connected us. I asked Chris if he’d be interested in sharing his story and he was game. So I went the same evening and went to that class with Chris, got to share a workout with him before asking to have him stick around after class and do a short interview to talk about his experience traveling to a lot of other boxes. So fire up the CrossFit affiliates map on main site! In 10 seconds, I’ll chat with Nomad CrossFitter Chris Kerr, and by the end you’ll be plotting your visits for a guest WOD. All right, well we’re recording. We’re live. We’re doing what I guess would be considered my first on-location interview. We’re here at Osprey Athletics in Bedford and I’m talking to my virtual Instagram doppelganger, boxjumps636 on Instagram. Chris, welcome to the podcast. Thanks, great to be here Jean. Talk about weird timing. I mean I just happened to be coming back from a trip having, boxjumped to a couple of places myself while away with the family, and when you messaged the gym to say hey you wanted to drop by, PJ, one of our members and one of the other administrators on our Instagram and Facebook accounts along with me … I was being safe, I wasn’t actually typing anything while I was driving, but I did see the exchange occur and I thought oh, that’s cute, he’s matchmaking us a little bit, realizing that you’re doing something that’s very much like what I started doing. Even before I decided to turn it into a podcast, was the idea of visiting other gyms and checking out what the community’s like. And you’ve got a unique line work that allows you – can afford you the opportunity to travel a little bit more, so why don’t you tell me just a little bit about what it is that you do and and how it is that you’re visiting all of these boxes all over the place. That’s a pretty large territory. Fairly large territory. What that translates to is about 220 nights a year away from home. Right now we’re here on what, the 8th or 9th of August? I just looked the other day I’ve got 160 hotel stays on the year, 38 flights and I put 65,000 kilometers on my car. How are you finding the contrast between the communities that you’re visiting versus the community of your home box? I’ve never been to two boxes that were even remotely the same. I’ve never been to a bad one either. I’ve had fantastic experiences at every gym I visited. I’ve been absolutely welcomed into the community at some. There are a few – and in fact, I say I don’t have currently have a membership, I do maintain membership at CrossFit Goliath in Raleigh, North Carolina, which is near my office. It’s the one place I spend enough time to warrant actually maintaining membership. I would definitely consider myself a member of that gym community. I stay in touch with them on their Facebook page and their Instagram and all of their socials. I’ve made some personal friends down there. In fact, a good friend of mine just split off – she’s opening her own gym just outside of Raleigh down there. There’s spots that I love to stop in every time I’m in town – I love to go and visit certain gyms, others, I just walk in knock on the door “hey I’ve never been here before, you got room for me in your class?” And I have yet to be turned away and I have yet to have a bad experience. That’s fortunately that’s been my experience as well. Like you said, I haven’t had a bad experience at any one of them. You definitely get a different vibe from one gym to the next. And a lot of that is influenced by who happens to be there the for the class that you happen to drop into, and who’s coaching and what the programming just happens to be on any given day, but you certainly get a sense of what the vibe is in that community and just by how welcoming there are. Fortunately every place that I’ve been to has felt largely like home, you know I mean. Everybody has completely, different styles of programming, different styles of coaching but frankly, you get that even in within your own box. One of the things that we wind up I guess occasionally having to remind ourselves, particularly when we get comfortable in our own gym setting, is that all the coaches are people too, so they have days where they’re distracted. Stuff outside the gym is influencing how they behave inside the gym and you know one of the best practices that I think every coach tries to put in play is to try to let that go and try to be the best they can possibly be at the front of the room at all times. But no matter what you do, there’s going to be variations from day to day, in how engaged you are and how successful you are in being that combination of instructive and entertaining and moving the class forward you know everybody hits it at different points and to different degrees from day to day. One of the best things that happened to me as a “traveling crossfitter,” if you will… probably about eight months ago – six or eight months ago – and forgive me, somebody in the internet land will probably correct me… but I listened to Chris Spealler’s podcast – one of the better ones out there. And he actually did an episode – he and Doug Zakaras, his cohort on the show – talking about how to be a good drop-in and how to host a good drop-in, both from a box owner and an athlete’s perspective. And for me, as an athlete traveling around, I never like to drop in cold. I always try to reach out to the box before I show up, give him an email like I did earlier today. I try to do it the day before, but sometimes the nature of my business, I’m gonna end up in a town I wasn’t expecting to be in. Give him a message, reach out on Facebook, social media or a phone call – something. Say “hey, look an experienced CrossFitter, been doing this for a while, travel for a living – I’d love to drop in. What works for you? I have yet to have anybody come back and say “no, that doesn’t work” it’s always been “come on by.” I like to show up early, I like to introduce myself to the coach. I always take a quick walk around the gym, familiarize myself with where the stuff is, because I want to be that guy going “where’s the kettlebells, where’s this, where’s that” you know. Have a quick look around. Always pay attention. Usually I try to latch on with the members as they come in. Like you know, are we doing a group warmup? Or is a warm-up posted and you do it on your own? I mean that changes box to box, how they handle that warmup. Some, it’s come in, sort yourself out, class starts on the minute – bang. Others, it’s “so everybody, we’re gonna grab the foam roller and stretch and do some mobile mobility stuff. Try to like familiarize myself and be flexible and go with the flow. Once the class starts, try to you know stay out of everybody’s way, do my thing. Again I’ve been doing this a while. I kind of know – you know, I don’t need to go to the chart and figure out what my 75% is. You know, I know what my numbers are. I’m show up prepared for class. Get out the right equipment and I’m ready to go and then once the class starts, I try to be coachable. I mean that’s the big one. You know, it’s so difficult when you’ve worked with a different coach every day and this coach is giving you “okay, you know, you’re landing with your feet a little too wide in your clean” and the next coach “your feet are too close together in the clean” and it’s really easy to sometimes get a little frustrated with different coaching styles or different techniques and people trying to throw at you. But it would be the same in going to the same gym and working with the different coaches within a box, you know, trying to balance one off the other. And every once in a while, you travel to a different box and a coach will tell you the same thing that everybody else has told you, and the way they tell you, it just clicks. And you just go with it, roll with it, you know. Try it. I love it when I go to a new box and I actually get some coaching. A lot of boxes you’ll drop in – as a drop in they’ll kind of ignore you – let you do your thing. Again, for me, that works. At home, I have a garage gym I work out by myself all the time. I try not to be too needy. But it is nice when we’ve got a coach that comes around and gives you some pointers and some cues. I mean, that’s why we come to boxes, right? You know, the great thing about the CrossFit model is qualified, experienced coaching. But you know, just try to be coachable. Try to go with the class flow, stay out everybody’s way. You know, socialize. I always try to introduce myself to everybody. You know, fist bumps and high-fives at the end. And then I always like to take a couple of photos of the gym. I post on my Instagram page, shoot a message to the Box afterwards thanking them for the drop-in. You know, collect a t-shirt here and there. And just I really enjoy it. It’s fantastic. Great way to travel. Oh yeah. Yeah, I mean, in visiting some of the gyms that I’ve been to, I’ve liked hearing different ways that different coaches with different experience, give different cues for ostensibly, even when I’m doing the exact same movement, from one workout to another – and getting a slightly different cue or getting the cue at a different time. You know? Some of that variation, you can get that in your own gym. There’s limits on how many variations you’re going here when there’s six or ten or twelve coaches in a gym, versus the experience that you’re having, going to you know three, four or five times that. Then you’ll get the benefit, or at least, arguably, there’s the opportunity for the benefit of hearing different cues from different coaches that have different experience. I certainly have found… You’re right, some of the coaches are really outgoing and very interested in coaching even the new drop-in, and then others are a little bit more tentative because they’re not really sure. They don’t know you yet, so they don’t know how coachable that you are. They don’t know how you’ll respond to their particular cues. And so some of them are a little bit more conservative in what they’ll say. And it’s interesting because I get to look at that from the perspective of the athlete. But also myself, being a coach, I like to hear as many variations as possible from as many coaches as possible because I’m finding that to be part of the learning exercise. And visiting all these other gyms as well. Absolutely. I don’t coach, myself, but from – again, from the experience I’ve had working with so many different coaches, there are moments and techniques and some drills and things that I’ve seen from an individual coach, but I’m gonna file that, because someday if I ever do decide to coach, I want to use that. I’ve also been to some and “that’s a little odd, I don’t know that that would necessarily be the technique I would take” but if I were coaching, and for those out there who are coaches, visit other gyms. I mean it’s a professional development, whatever you want to call it – personal development. Just the experience. Drop into the gym up the street. Drop into the gym in the next town and just sit at the back of classes and watch other coaches coach. You can’t help but pick stuff up. I see that as well. I mean I’m considering doing my L2 sometime fairly soon and you know that program is explicitly about making you a better coach, so it’s all about workshops and feedback sessions with the flowmaster and the coaching environment that you have in that setting, and other coaches giving you tips on what you’re doing well, what you need to improve and breaking it down into components. I’ve always seen going into other gyms as sort of a mini opportunity to take that same thought process into what I’m doing. That’s why I’ve liked going to other boxes. Not only experiencing their classes, but for some of them I’ve dropped in well in advance of the class, met the owner, gotten kind of the lay of the land. They talked to me about, you know how they’ve built up their gym and what their approach has been and how they’ve staffed up and all of these things… So I wound up getting kind of the behind-the-scenes look at the way that their gyms are run. And it gives me kind of an interesting perspective on the way things might ultimately move for a whole bunch of different gyms. You look at what’s similar between them and then what’s a little bit different and how some people come from it from a business background, others come purely from a sport/athletics background. Others come – you know, they’re physios, they’re kinesiologists and they found a sport and they decided to turn it into a business. So there’s this interesting mix that you get with the box owners and with coaches. And so you visit all of these places, and you get a real good sense of where the community’s head is. And it’s an interesting time too because you go to visit the gyms and you get to see it in person it’s a little bit different. I mean, there’s such a deep amount of information available at fingertips with YouTube and the various gyms having their own websites and blogs and posting articles and putting videos up on all the various different social media channels, so there’s a lot of publishing opportunities for all of these experts that try out different things. I get tons of tips from you know CF Gymnastics and Main Site, and certainly when I’m listening to the podcasts… I just listened to been Ben Bergeron’s podcast this week and strangely, despite the fact that it wasn’t video, he was talking about the technique for Ring muscle-ups that I only just got recently, but the way that he described it has me thinking about a different thing that I’m gonna try the next time I jump up on the rings. And just the amount of information you can get from so many different expert sources now that you know even in CrossFit’s infancy would have been challenging. I mean, they built up that entire business while that technology was emerging. Absolutely. I mean CrossFit.com publishes so much stuff directly through CF Gymnastics CF Weightlifting through the Main Site… Guys like Ben Bergeron, very free with information for Box owners out there, Chris Cooper, Two-Brain Business and Catalyst Athletics, up in Sioux Saint Marie. Shout out to Chris – I dropped into his gym a month or so ago. You know that there’s all these guys out there now. You know, gyms typically came from guys who wanted to work out, and found a way to make a living doing it. Yeah, I jumped on whole-hog, but for those out there who do travel for business. And in any aspect, you don’t have to travel as much as me, but you’re in a new town on vacation, on business, whatever – even you’re on the other side of town and you don’t think you’re gonna make class of your own, reach out. It’s map.crossfit.com – it’ll show you where the local Box is. I hit up their website, hit their social, shoot them a message, drop in – you’ll never go wrong. But no, I like to join in on the class and see the coaching, and yet some weeks, your programming isn’t exactly gonna follow. But you’re gonna get a good workout. You’re gonna feel great. Yeah certainly. You know Chris Spealler’s podcast, certainly he and Doug have been talking about this idea of, you know, “fitness is fitness.” I mean you know, just do CrossFit – you know, you don’t have to be going for a PR in every class. You can always adjust the programming. And if you’re talking to the coaches, you know the coaches are… the best test for them is to have you come up and say “you know what, this particular movement – either I’ve done a lot this week or I’m not really feeling great I need to adjust, what do you recommend to maintain the intent?” And so you may not get the same periodization that you would get if you were maintaining your own programming, but you’re still going to get the fitness benefit, and you control intensity and you can talk to the coaches that are there about modifying movements in order to maintain intent and still get the benefit. So you know, there’s not really all that many ways that it can go wrong if you’re really thinking about it and applying yourself to that idea of, you know, you’re just there to be part of the community and get the workout in. Certainly better than staying home. Yeah absolutely. And failing that, go on Google, go on Facebook, go on Instagram – search for body weight or hotel gym workouts, you know. If you’re traveling, throw a speed rope in your bag, find a gym, find a hotel gym that’s got some heavy dumbbells – do 50 40 30 20 10 double unders and heavy dumbbell cleans. You’ll get a few strange looks from the other folks in the hotel. But that’s ok. Get used to that, Get comfortable with that. I’ve pushed the benches up against the wall and, you know – doing burpees over benches in the hotel gym with your shirt off tends to get some odd looks but whatever. That’s alright. And most of them have pools too so, you know you can get a couple of different workouts and you might not be able to get in your box either so yeah. I love the challenge of being able to work out on the road and you know, I’ve been fortunate everywhere that I’ve had to go has been kind of a major center, so finding across with box hasn’t been difficult. In fact the challenge has been picking which one I want to visit. But it’s been great because you know just about every time I’ve had several of them respond “yeah, we’ve got room” and either there’s a drop-in fee or there isn’t a drop-in fee or there’s some combination where you buy a shirt and you get a free class or whatever the case may be. But they’re all pretty accommodating. Got the address plugged into my GPS, and as I’m pulling up, I’m running a little late. I pull in and I’m in a subdivision – the address is a house with a two-car garage. I park in front of the house and I’m googling again “Have I got the right spot? This can’t be right.” I look up and in the corner of the garage window I see a little sign. And I walk up and this little sign says “CrossFit Attain through the side entrance.” And I walk in and it’s a 300 square foot garage with four deadlift platforms for squat racks and they ran a class. They’re full-fledged affiliate out of a garage gym. It was like the good old days of CrossFit circa 2008. I didn’t think they existed anymore. What a great workout. We did DT and 400 meter runs. It was killer workout, running up and down the street in the subdivision. 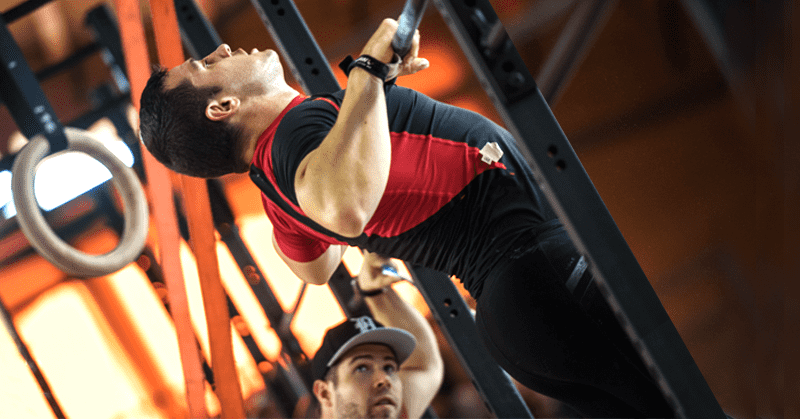 Or find yourself in a major city… Go to Edmonton, if you’re in Edmonton, hit up CrossFit Armory – two locations, massive facility, excellent coaches, bunch of regional athletes roll out of that place. Great spot. I wouldn’t put one above the other in terms of the quality of the coaching or the workout. Just find a gym, get in you’re gonna get a good workout, meet some great people and you’ll fill your closet full of t-shirts in no time. Yeah that’s the thing that I found every place that I’ve been to. I’ve been to some really big ones with regionals athletes and other small locations. You know what? The deadlift, the barbell and plates – they all still weigh the same. So you know as long as there’s a quality coach that’s really keeping an eye on the athlete, you’re gonna get the same kind of workout. Doesn’t matter where you’re do. All right. Well, thanks Chris, I really appreciate it. The clock has run out. Are you thinking about visiting another box? I know I am. Chris’s visit was a great opportunity to talk to a guest CrossFitter about a very different spin on the experience of visiting another box. It’s a fundamental part of how he trains, and it presents some interesting challenges. But as you heard, he gets a lot of benefit from it too. I hope everyone listening will take some of what Chris had to say to heart. Find an affiliate either nearby or while you’re on vacation or away for work, and don’t be afraid to jump into a WOD, check the ego, be coachable, work hard, move safely and have fun. Please subscribe on your favorite podcasting platform so you get up you upcoming episodes automatically as I’m joined by more guests to talk about fitness and health. And if you liked this episode, do me a solid and write me a 5 star review on iTunes I hope to share some more reviews and comments in future episodes you can email feedback or ideas or really anything to me at info@BoxJumper.ca, and of course visit the BoxJumper.ca website for more fitness related “stuff” outside the podcast and you can follow me on Instagram, Twitter and Facebook with the handle @boxjumperover40 (with 4-0). Thanks for listening! Once again lots more to come until then, stay healthy, WOD happy and WOD often… and just maybe, WOD on the road!